Holiday carolers, elves and Santa himself will be at the annual Abbot Kinney Holiday Stroll on Sunday, December 13 from 11 a.m. to 5 p.m. Shops along the boulevard will feature special deals and events, and there's plenty of fun and festive activities for the kids too. 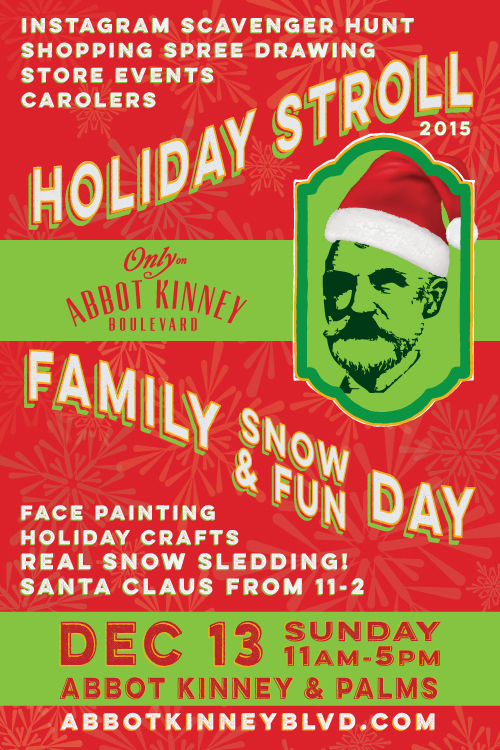 Kids can enjoy sledding, holiday crafts and face painting, and from 11 a.m. to 2 p.m., visit with Santa. He'll be at the Holiday Headquarters located at Abbot Kinney and Palms. 1- Shop on Abbot Kinney Blvd during the Holiday Stroll. 3- Get one free raffle entry for each $25 (pre-tax) you spend! 1- Find the six Holiday Elves along Abbot Kinney Blvd and take photos of them. 2- Tag your photos #AKHoliday2015 and post photos of all six elves to your Instagram. 3- Show your posts at Holiday HQ at Abbot Kinney & Palms and get one free entry!